The global market is expected to reach USD 2.33 Billion by 2021 from USD 1.68 Billion in 2016, at a CAGR of 6.8% from 2016 to 2021. In this report, the global market has been broadly classified on the basis of product, depth of burn, end user, and region. On the basis of product, the market is segmented into advanced burn care, biologics, traditional burn care, and other burn care products. The advanced burn care products segment is expected to account for the largest share of the global market in 2016. The advanced care products segment is further classified into alginate dressings, collagen dressings, hydrogel dressings, hydrocolloid dressings, wound contact layers, film dressings, and foam dressings. However, the biologics segment is projected to witness the highest growth rate in the market. On the basis of depth of burn, the burn care market is segmented into minor, partial-thickness, and full-thickness burns. The partial-thickness burns segment is expected to account for the largest share of the market in 2016, owing to the increasing usage of advanced dressings and biologics like skin grafts and substitutes. On the basis of end users, the burn care market is segmented into hospitals, physician clinics, home care, and other end users. The hospitals segment is expected to account for the largest share of the global market in 2016. Factors such as increasing awareness of burn care and rising incidence of burn injuries are driving market growth in this segment. Geographically, the burn care market is dominated by North America, followed by Europe, Asia, and the Rest of the World (RoW). Growth in the North American segment is primarily driven by the increasing demand for biologics like skin grafts and its substitutes and high usage of advanced dressings in the U.S. The prominent players in the burn care market are Smith & Nephew plc (U.K.), Mölnlycke Health Care (Sweden), Convatec Inc. (U.K.), Acelity (U.S.), Coloplast A/S (Denmark), Derma Sciences, Inc. (U.S.), Medtronic (Ireland), and 3M Company (U.S.). This report aims to provide insights on the global burn care market. It provides valuable information on the product, depth of burn, end-user, and regional segments of the market. Leading players in the market are profiled to study their product offerings and understand the strategies adopted by them to be competitive in this market. 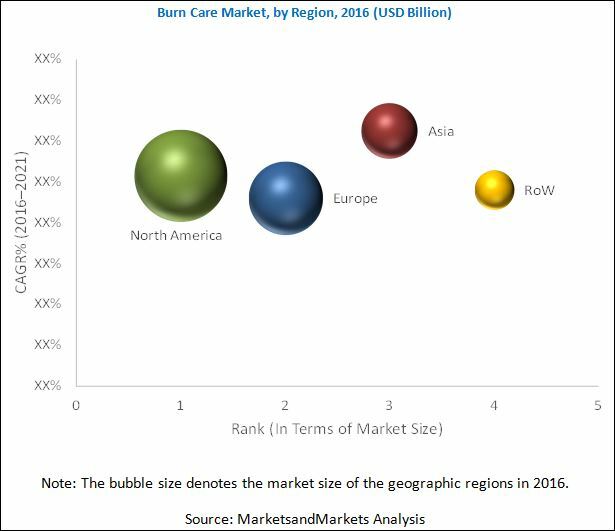 The burn care market is expected to reach USD 2.33 Billion by 2021 from USD 1.68 Billion in 2016, at a CAGR of 6.8% from 2016 to 2021. In this report, the market has been segmented on the basis of product, depth of burn, end user, and region. Factors such as rising incidence of burn injuries, increasing healthcare expenditure, rising awareness on burn care, and advancements in burn care treatments and products are driving growth in the market. However, high cost of treatments and products is expected to challenge the growth of this market to a certain extent during the forecast period. The global burn care market is segmented into four major product categories, namely, advanced burn care dressings, biologics, traditional burn care and other products. The advanced burn care dressings segment is expected to account for the largest share of the global market in 2016; while, the biologics segment is projected to witness the highest growth rate in the forecast period. Based on depth of burn, the burn care market is segmented into minor, partial-thickness, and full-thickness burns. The partial-thickness burns segment is expected to account for the largest share of the market in 2016, owing to the increasing usage of advanced dressings and biologics like skin grafts and substitutes. Based on end users, the burn care market is segmented into hospitals, physician clinics, home care, and other end users. The hospitals segment is expected to account for the largest share of the global market in 2016. Based on type, the hospitals segment is further categorized into inpatients and outpatients. The major players in the market are Smith & Nephew plc (U.K.), Mölnlycke Health Care (Sweden), Convatec Inc. (U.K.), Acelity (U.S.), Coloplast A/S (Denmark), Derma Sciences, Inc. (U.S.), Medtronic (Ireland), and 3M Company (U.S.). 11.4 Convatec Healthcare B S.A.R.L. Figure 102 Company Snapshot: Convatec Healthcare B S.A.R.L. Figure 105 Company Snapshot: Derma Sciences, Inc.